The wife of Bob Marley has told a court in London a bassist suing the singer's estate was not seen as a member of Marley's band, the Wailers. Aston Barrett claims he is owed £60m in royalties from a contract signed with Island Records in 1974, plus earnings from songs co-written with Marley. 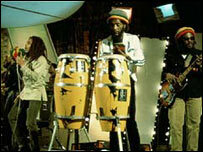 But Rita Marley told the High Court that Mr Barrett and brother Carly were "viewed as backing session musicians". The bassist was a member of the band from 1969 until Marley's death in 1981. Mrs Marley told Mr Justice Lawson at the High Court that Bunny Livingston and Peter Tosh were the original Wailers and contributed to the writing and performing of songs with her husband. But she said Aston Barrett and his drummer brother Carlton were never "part of that process". "Pete and Bunny were the members of the Wailers. Aston and Carly came in after, long after." Mr Barrett's lawyer Stephen Bate pointed out that the Barrett brothers were credited alongside Marley, Livingston and Tosh on Marley's early albums with Island Records, Catch A Fire and Burnin'. But Mrs Marley said: "The Barretts did not have the same role as Pete and Bunny, and by that stage Bob was clearly the leader of the group." She did, however, acknowledge that the bassist and his brother brought a unique sound to the group, adding: "My husband was very much involved in making that sound. It was not just Aston and Carly, Bob had part of the responsibility." Mr Barrett, 60, alleges he was only paid a proportion of the amount owed to him after Marley's death. His brother Carlton Barrett was murdered in 1985. 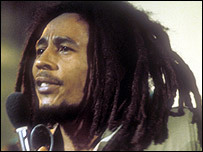 Universal-Island Records and the Marley family say Barrett gave up his right to further royalties in a 1994 settlement. The case was adjourned until Wednesday. It is expected to last up to three weeks.